Beading Arts: Another Murano glass pendant giveaway! 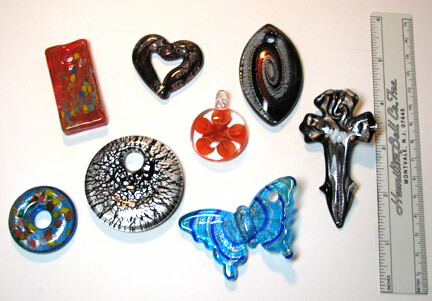 The next pendant on the block is the red rectangle in the top left corner (Murano Style Glass Rectangle Pendant, Red, 24x50mm). All you need to do for a chance to win it is to leave me a comment telling me what you plan to use it for and you'll automatically be entered. If you tweet or post on Facebook or other social spots about the contest, you can leave a second comment and be entered twice! Please please please make sure that your link will lead me to an email address, or else I won't be able to contact you. No contact, no win, and I simply have to go on to the next person. Deadline: December 2, 2010. Check back each week for new chances to win! Love that bead! Quite beautiful. It wouldn't arrive in time; but if it did, I would use the red glass pendant for June's November Creativity Challenge which is "Red". I am starting a beaded embroidery collage in January and it would fit beautifully into my design. i would want it somewhere i could look at it often maybe i would make some car jewelry and hang from my rearview mirror! have some red crackle glass beads that would just perfect with the red triangle! I would make a necklace with that exquisite Murano pendant. I would use my red baptism seed beads from the Yukon Territory and my shiny black hematite vintage seed beads from Bellevue in my design. That would make it a special Christmas 2010 pendant for me in truth. I would make a pendant out of this beautiful bead. i have been learning about wire wrapping, so that what i would do with this pendant...wrap a little decorative wire around it and make it into a necklace. if i should happen to win, my email is indigosbeads (at) live (dot) com. The red glass pendant would be nice with some gold and jade. Might be nice as part of a tassle! I have a daughter who loves red and would give it as a gift in her Christmas stocking as a necklace. It is so lovely.